a warrior, and a hero – battling against terrorism and securing our Nation. I just spoke to Mattis, who reconfirmed that, and I quote, “Ryan was a part of a highly successful raid that generated large amounts of vital intelligence that will lead to many more victories in the future against our enemies.” Ryan’s legacy is etched into eternity. For as the Bible teaches us, there is no greater act of love than to lay down one’s life for one’s friends. Ryan laid down his life for his friends, for his country, and for our freedom – we will never forget him. But none of that mattered. When a military operation – almost any military operation – is invoked for political or patriotic purposes, the details are unimportant. As with the Yemen raid of 2017, so with the Battle of Vimy Ridge of 1917. 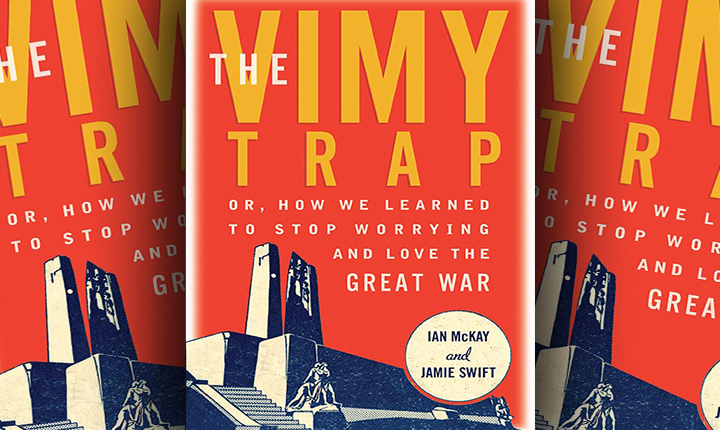 The Vimy Trap is a historiography of Vimy, and of Canada’s participation in the First World War more generally – supplemented by an extensive and useful bibliographic essay. It is not so much about the war itself as about its representation in the years since in books, newspaper photos and their captions, painting and sculpture, films, radio documentaries, exhibits in the Canadian War Museum, even video games. It is about the impact of Vimy on our sense of ourselves. Though full-blown Vimyism is a relatively recent phenomenon, different conceptions of the war have been in competition in the entire century since 1914. During the war itself, the official attitude toward the war was expressed in what historian Paul Fussell, cited by McKay and Swift, called “High Diction”: the language of honour, valour and sacrifice. Even then, High Diction ran up against the “Low Reality” of the war, a notable expression of which was Fred Varley’s grim 1918 painting For What? A current of disillusionment ran through the postwar period, and among the most disillusioned were the returned soldiers themselves. Erich Maria Remarque, whose 1929 novel All Quiet on the Western Front typified the “Literature of Disillusionment” of that period, was a veteran of the Western Front; so was the Canadian Charles Yale Harrison, author of Generals Die in Bed (1928). This mood was reflected in the creation of the imposing monument to Canada’s war dead that was dedicated at Vimy Ridge in 1936. 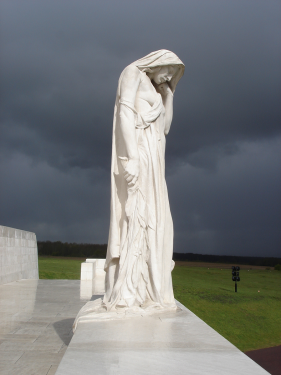 In the Canadian National Vimy Memorial’s dominant figure, sculptor Walter Allward portrayed Canada as a grieving woman, “Canada Bereft” as he called her or Mother Canada as she is popularly known. At the top of the monument’s twin pylons are the symbolic figures of Justice and Peace, with other symbolic figures below. 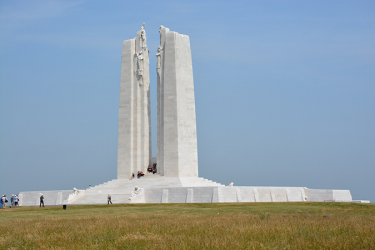 The Vimy Memorial, a familiar image that graces the reverse side of the 20-dollar bill and says “Vimy” to many Canadians, is far from being Vimyist. After Prime Minister Borden went to France to visit the wounded of Vimy Ridge, he returned home to Canada in May convinced that the country should move ahead on compulsory military service. Shortly after that, on 24 May, Montreal became the scene of anti-conscription riots. Rather than leading the country almost magically to attain new levels of unity and togetherness, Vimy Ridge was the prelude to an unprecedented conflict in Canada so serious that it raised the prospect of the country’s violent dissolution. McKay and Swift favour a very different style of war remembrance, typified by a pair of statues by German artist Käthe Kollwitz, which stand in a German military cemetery in Belgium where her 18-year-old son, killed in 1914, is buried. They note that Kollwitz’s work, The Grieving Parents, “has no trace of patriotic bombast.” Rather, it expresses grief for her son, for all the victims of the war, and for her generation’s failure to prevent the catastrophe. A more recent example of appropriate commemoration in the Ring of Remembrance in Ablain-Saint-Nazaire, France, not far from Vimy Ridge, dedicated on November 11, 2014. Consisting of 500 metal panels, it contains the names of nearly 600,000 soldiers on both sides killed in northern France, listed alphabetically without regard to nationality or rank. Another elaborate ceremony took place at Vimy Ridge on April 9, 2017, to commemorate the 100th anniversary of the battle. While there were notes of Vimyism in the ceremony, especially in Prime Minister Trudeau’s speech, the dominant mood was more subdued. Trudeau evoked the familiar tropes of the battle bringing Canadians together and allowing Canada to stand as an independent actor on the international stage. But under the brooding figure of Mother Canada, in a battlefield still pockmarked and dotted with unexploded shells, Loreena McKennitt’s “Dante’s Prayer” better suited the occasion. François Hollande of France, in the waning days of his presidency, had the grace to remember the German soldiers who died as well as those of France, Britain and Canada. Even Trudeau, after his Vimyist excursion, concluded his speech with a passionate call for peace and the words “Never again.” In the CBC’s coverage of the event, Peter Mansbridge and others noted that the capture of Vimy Ridge did not change the course of the war. Perhaps the high tide of Vimyism has passed and Canada can move on to a more sober assessment of its military past. Perhaps Canada has matured to the point where it no longer needs a battle to define its identity. Perhaps the world is slowly finding better ways to resolve disputes than the use of force. Perhaps. On April 6 (coincidentally the 100th anniversary of American entry into the First World War), President Trump ordered a missile attack on a Syrian air base in response to the Syrian regime’s use of chemical weapons. Once again commentators declared his move presidential (there had been some backsliding since his February speech). Once again, “Donald Trump became President of the United States” – this time according to Fareed Zakaria on CNN. A battle makes a nation. A missile strike makes a presidency. How we remember war affects how we think about it now. McKay and Swift’s account of how we remember Vimy is of more than historical interest. 1 See Amy Davidson, “The Shameless Expediency Of President Trump’s Address to Congress,” New Yorker, March 1, 2017, retrieved here; John Cassidy, “Dont Be Fooled: Donald Trump Didn’t Pivot,” New Yorker, March 1, 2017, retrieved here; Julie K. Brown, “Slain SEAL’s Dad Wants Answers: ‘Don’t Hide Behind My Son’s Death,’” Miami Herald, February 26, 2017, retrieved here; Eric Schmitt and David E. Sanger, “Raid in Yemen: Risky from the Start and Costly in the End,” New York Times, February 1, 2017, retrieved here. 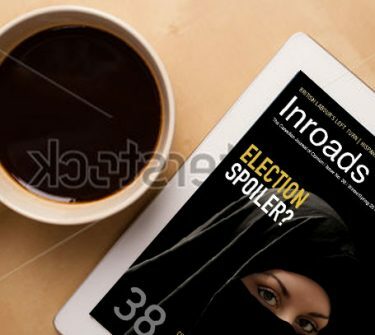 2 See Dominic Cardy, “Syria and Liberal Interventionism – II,” Inroads, Winter/Spring 2017, pp. 18–30.